As long as I can remember I have felt a deep connection to forests. 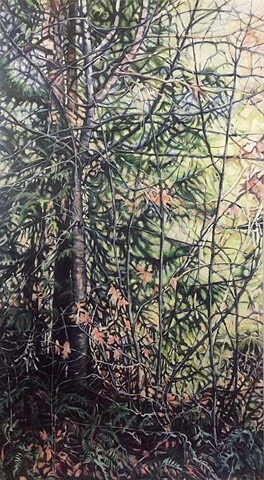 My artwork is influenced by a life spent exploring the natural landscapes of BC. I love to examine the beauty and resilience of nature and am inspired by the natural world's ability to overcome the impacts of a world in decline. I feel most alive when I am inside the scenery, ensconced in cool darkness, experiencing how nature regenerates and rebounds. Through my training in landscape architecture and botany, I learned of nature's deeper secrets and inner workings. But my paintings and drawings are not simply a view of the landscape as a backdrop, rather, they are an exploration of their deeper meaning. As an avid naturalist and explorer, I attempt to restore the ancient mythological reverence for Nature, and the mysteries in its shadowy depths.